How did Jimmy do this? Although both Selwood (37 disposals) and Dangerfield (38 disposals) have had good games, they have lacked support throughout the game. The Swans have converted five goals from five intercepts in their forward half. Jones' 15 rebound 50s is the most of any player this year. Swans InterchangeJosh P. Kennedy and is possibly out for the game. Z. Jones and D. Rampe have been very important in the defensive half for the Swans. Jones has had 20 disposals and 14 rebound 50s, and Rampe has had 21 disposals at 95 per cent efficiency as well as 10 rebound 50s. 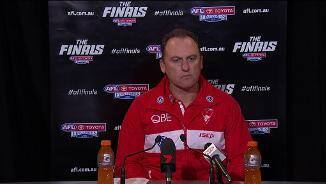 The Swans have won the first five clearances of the final term. 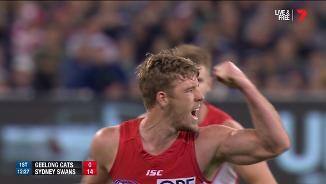 Heeney has backed up his great game last week with another one this week. He has had 22 disposals, ten contested possessions, six tackles, five marks and a goal. 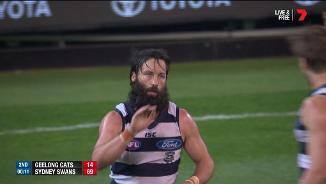 Cats InterchangeJed Bews off due to an injury. Geelong has been able to get on top in the third term, they have had 15 inside 50s to five and kicked four goals to two. 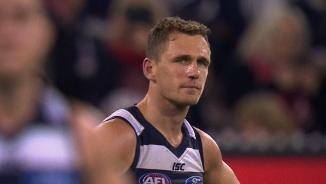 This is on the back of Selwood and Dangerfield who have had seven disposals each this term. Cats InterchangeLachie Henderson off due to an injury. The Cats have scored from just 30 per cent of their inside 50s tonight, throughout the season they have scored from 49 per cent of them (ranked third). The Cats have laid 16 tackles inside 50 compared to Sydney's four. Swans InterchangeLuke Parker off due to an injury. The Cats have had the first six inside 50s of the term but have only managed one behind. Swans InterchangeJeremy Laidler off due to the blood rule. The Swans lead scores from turnovers by a whopping 40 points, throughout the season they have averaged a differential of plus 14 points. The Cats lead clearances 23 to 17 through Selwood and Dangerfield who have six each. Despite this, the Swans lead scores from stoppages 24 to nine. Despite the Cats leading second term inside 50s 12 to six, the Swans have still managed three goals to one for the term. By beating the Cats on the inside. the Swans have been able to get them on the outside too. They lead uncontested marks 32 to 11 and uncontested possessions 84 to 56. After winning the contested possessions by 52 in their last game, the Cats trail the count by five tonight. Franklin's three score assists is the equal highest recorded by Champion Data in the first quarter of a final. 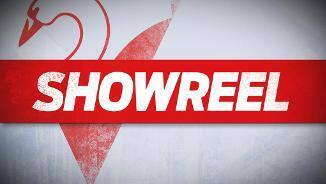 Sydney has had 18 short kicks to Geelong's three. The Cats are ranked third in this stat whilst the Swans are ranked 16th. An unbelievable start from the Swans sees them leading 32 to zero early on. They have kicked three goals from centre bounce chains which is six points more than their season average. The Swans have been dominant early, the ball has been locked in their forward half for 70 per cent of the game so far. Franklin delivers his second score assist of the game with a short kick to Tippet, who converts the Swans' second goal from their sixth inside 50. The Swans are off to a flyer with the first goal from the first bounce of the game. The Swans have allowed their opposition to score a goal from only 19 per cent of inside 50s this season (ranked first). Geelong was outscored by 24 points from clearance chains in its last encounter against the Swans in round 16, this was the Cats' third worst differential in any game this season. Welcome to MCG for the Geelong Cats v Sydney Swans Round 3 clash. 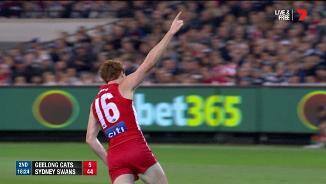 THE SYDNEY Swans have stormed through to their third Grand Final in five years with a fearsome 37-point win over a shell-shocked Geelong at the MCG on Friday night. In a pressure-football master-class that defied what has been a bruising September, the Swans dismissed their opponents in a brutal first half and were never seriously challenged, winning 15.7 (97) to 8.12 (60). 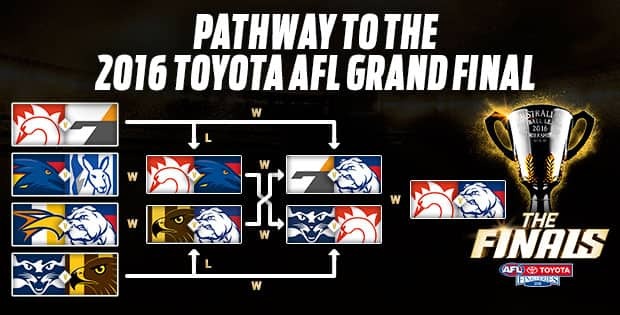 The win keeps the prospect of an historic all-Sydney Grand Final alive, with Greater Western Sydney and the Western Bulldogs to face off on Saturday for the right to meet the red-hot Swans. Defender Aliir Aliir will face a race against time to play in the premiership decider after suffering a right knee injury late in the first quarter and being put on ice for the rest of the match after a fitness test. Midfielder Luke Parker also suffered a left knee injury in the second quarter, but played on and was influential in what was an emphatic statement from the minor premiers in front of 71,772 fans. Coming off a six-day break and nursing sore players after physical finals against GWS and Adelaide, the Swans had much to overcome against a Geelong team that had played once in 27 days. But the Cats' unique preparation, as a result of the pre-finals bye, might have been the bigger hurdle, with Chris Scott's men slow out of the blocks and unable to regroup. 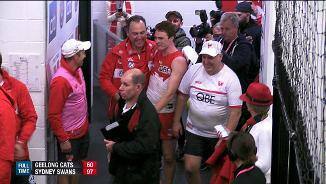 They couldn't handle the Swans' revered midfield pressure, with the aggression and commitment of John Longmire's men creating turnover after turnover. "It was enormous, our pressure at the ball and the man with the ball, and the way we attacked the contest was really ferocious in that first period of the game," Longmire said after the game. "We were really able to build our game on that … it was just fantastic." Midfielders Dan Hannebery (29 possessions), Josh Kennedy (25) and Tom Mitchell (27) were immense, while captain Kieren Jack was a battering ram with 13 tackles. It was young Swan Isaac Heeney, however, who shone brighter than them all in a brilliant 28-possession performance that further cemented him as a star of the future. Superstar forward Lance Franklin finished with two goals and will head to his second Grand Final with the Swans, while first-year Swan Tom Papley kicked a game-high three goals. The Swans' defenders were rock solid, with the returning Zac Jones and mainstay Dane Rampe combining for 28 rebound 50s and 48 disposals. Geelong superstar Patrick Dangerfield battled all night to finish with 39 possessions, nine clearances and nine inside 50s, but the Swans limited his effectiveness and burst with the ball. Captain Joel Selwood was equally brave with 39 possessions (including a finals record 23 contested) and 10 clearances, and the pair was largely responsible for their team finishing with an incredible 72-40 advantage in inside 50s. But the Cats' midfield depth quickly dropped away and their ball-use was second-rate, with too many players not rising to the occasion. "They jumped us and, no matter what we tried early, we couldn't stop that," Scott said. 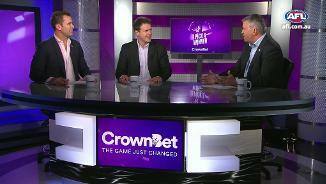 "Then they were just extraordinarily efficient, relative to us. Their work around the contest was first rate. 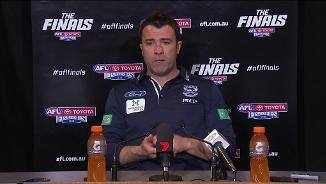 "They were clean with the ball and we weren't. That was in part because of us and in part because of the pressure they put on." The Swans were bold at selection, picking ruckman Kurt Tippett after a week sidelined with a fractured jaw, and speedster Gary Rohan six days after suffering bone bruising. Their faith was rewarded immediately, with Tippett kicking two goals in the Swans' opening burst and Rohan influential early with his attack on the ball. Franklin was the star early, pushing up the ground on Tom Lonergan to win nine first-quarter possessions and setting up Tippett's second goal with his brute strength in a one-on-one contest. Tippett's goal gave the Swans' a 32-point lead, with the rattled Cats yet to factor on the scoreboard. Their first score was a rushed behind 16 minutes into the quarter and, after missed set shots from Selwood and Tom Hawkins, they entered the first break on 0.5 and trailing by 39 points. 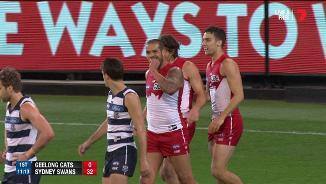 Geelong's first goal came four minutes into the second term when Hawkins converted a set shot, but it was momentary relief with the Swans unrelenting in their pressure. There was no margin for error when the Cats had the ball, with missed handballs and kicks being punished as Xavier Richards and Tom Papley added to the pain. When Franklin converted a 50m set shot on the boundary, the Swans were out by 55 points and destined for the Grand Final.